I had to work on the 4th this week, but Mom baked a pie for us (using the fruit from my yard), so we got to have a bit of a celebration in the morning before I left for work. My weekend was Friday and Saturday. On Friday, my parents drove us down to Monterey, where we attended the wedding of my neighbors. (It was a really pretty ceremony, in which the role of "flower girl" was played by the couple's dog, who had the basket attached to her collar.) After the reception, we retired to our Mission-style hotel room (in which nearly every flat surface was covered with red tile) to play a bit of Hanabi. After breakfast at the hotel Saturday morning (at which I found that--not unexpectedly--vanilla yogurt really doesn't make a good substitute for mayonnaise), we went for a drive down to Big Sur and spent some time looking out at the ocean. On our way back, we stopped briefly in Carmel, where we shopped at a toy store and a cheese store. As we were returning, we were curious about all the traffic headed in the opposite direction, so we turned on the radio to find out if there were some kind of event or festival going on to attract so many travelers. That's when we heard the news about the plane crash on the runway at SFO that morning. I am really grateful that I wasn't at work when it happened, though I am a bit concerned about how it will impact the airport today. Ohh, I didn't even thing about how the crash might affect your work! I hope it turns out to have little or no impact and you had a good day! I hope it turns out to have little or no impact and you had a good day! Half the flights were either cancelled or delayed, but there were still enough passengers coming through for Benny to get a good workout. I'm so glad you were off on Saturday. It must have been a very traumatic experience for the passengers on the flight who were fortunate enough not to be injured, and in general very alarming and disruptive for everyone at the airport. I didn't think you knew any of your neighbors well enough to attend a wedding! How awesome! I probably wouldn't, if it weren't for megory. These are the neighbors she invited in for a tour of my house (when the house next door was up for sale but temporarily unavailable for viewing) while I came out of my bedroom in pajamas and was like, "Whuh?" She kept up a strong relationship with them after that. I mainly just say "hi" every once in a while when I see them outside, and give the occasional piece of gardening advice. Oh, and their dog comes over to visit me whenever she escapes from her yard. 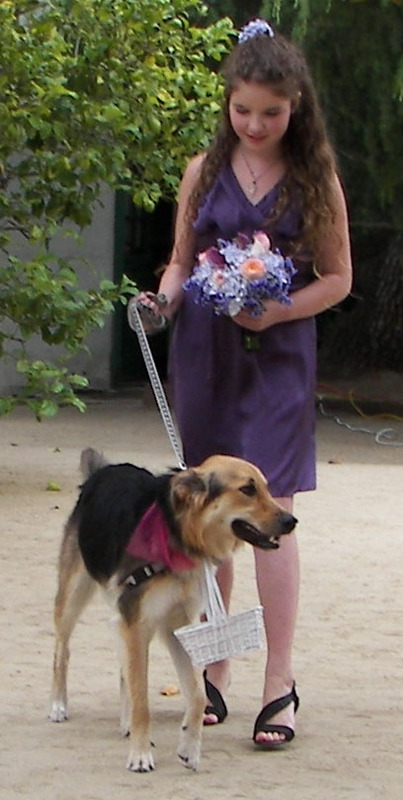 Aww, the flower girl dog sounds adorable. Did you take a picture? I'm glad you weren't working on Saturday (what a nightmare that must have been for everyone there! ), and hope things get back to normal soon at the airport. Aww, what a cutie! Did her scarf match the wedding colors, or was that just to make her look fancy? Did her scarf match the wedding colors, or was that just to make her look fancy? The scarf is actually all you can see of her corsage, also attached to her collar. (I think it's hidden behind the basket in the photo.) The corsage matches the wedding colors, which were blue and purple like the bouquet in the girl's hand. She was really cute.